If Halloween means one thing in the food world, it’s sugar. And, don’t get us wrong, we love our Halloween candy! But, it’s easy for a few pieces here or there to turn into a lot of pieces on the reg — not to mention noshing on Halloween candy as a snack when you have a lot left over after All Hallow’s Eve. In graduate school, I succumbed to a serious sugar craving situation that resulted in about 10 extra pounds (but, gosh darn-it, that leftover Halloween candy didn’t go to waste!). Don’t be like me — because, believe me, losing that extra sugar weight isn’t fun. Learn how to stop sugar cravings NOW with our best tips! 1. Protein up. Protein helps to stabilize your blood sugar and keeps you feeling full. So eat protein with breakfast and every other meal and snack you have. Bonus if you can get some veggies, healthy fat and fiber in there, too. This tip alone will help you to stop sugar cravings big-time. 2. Enjoy Halloween candy as a real treat. Resist the urge to snack on and eat Halloween candy when you’re hungry. Instead, honor your hunger by getting a real, whole snack or meal (again, with protein and veggies) in. Then, if you’re still wanting a little something sweet after your meal, have a small piece or two of Halloween candy — and savor it just like you would any dessert. It’s a special treat! Don’t feel guilty about it; just slow down and enjoy it. 3. Keep it out of view. Studies show that you’re more likely to eat candy when you see it. So get that Halloween candy out of sight! Put it in the back of the pantry, take it to the office breakroom that’s far away from your desk — out of sight, out of mind. 5. See if you have a full-out sugar addiction. Sugar addiction is a real thing. 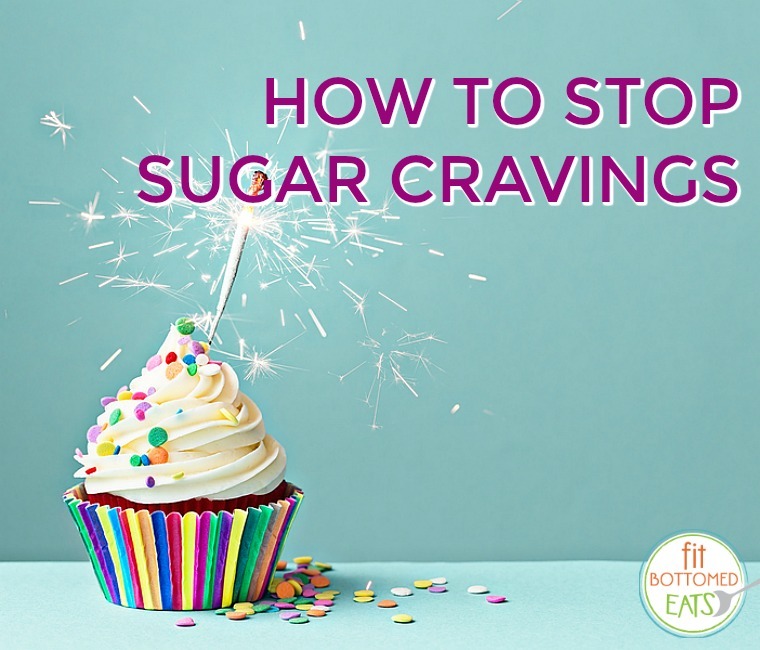 If you’re really having trouble with sugar cravings, read this post. If you do think you’re addicted, follow these tips to break it. Other no-brainer tips how to stop a sugar craving? Stay hydrated, make sure you’re eating out of hunger and not boredom or emotion, and try not to deprive yourself too much. Funny how when we make something “off-limits” it magically becomes that much more delicious, eh?